First of all, apologies if this isn't the right forum for this. I've been trying to set something up in my game where you go to the menu, go to your items, use a specific item in a specific place, facing a specific direction, and this causes something to happen. It's that "in a specific place, facing a specific direction" part I'm having trouble with, though. I've heard tell you can set this up with common events, but I haven't been able to find any good tutorials that set up what I'm looking for - the closest ones I found have the player activate an event, which calls up the item menu, when I want the player to call up the item menu themselves. Can anyone explain how I can accomplish what I'm trying to do? your item would call a common event, yes. Which can be setup something like this. 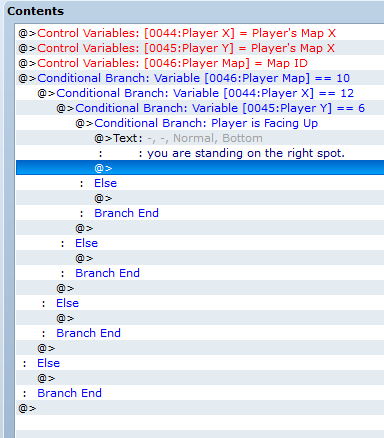 Control Variables: [0045:Player Y] = Player's Map X? Shouldn't that be set to Player's Map Y? It works! Thanks a whole bunch. You're not the first to do this sort of thing. Actually, thirty years ago, Square did this with all key items in Final Fantasy, though it was area based for the most part (a few items did require standing in one spot facing a specific direction). But yeah, roninator got this on the nose; I would of demonstrated the same method.